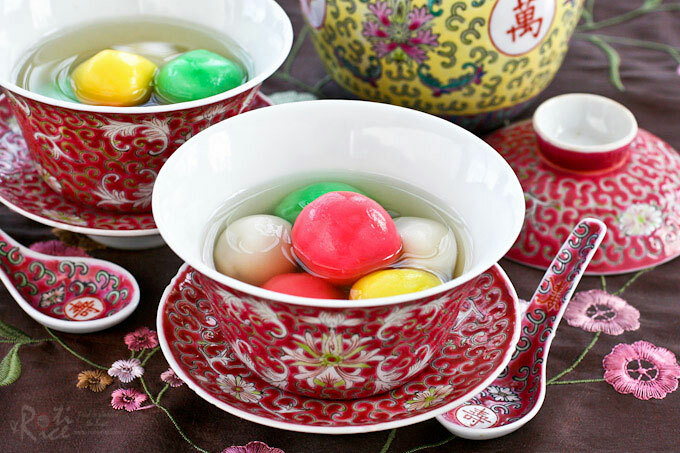 Tang Yuan is a dessert made of glutinous rice balls in a sweet clear soup usually served during the Winter Solstice Festival to mark the arrival of winter. Winter Solstice Festival, also called Tang Chek in Hokkien/Fujianese or Dong Zhi (冬至) in Mandarin, is a Chinese celebration that usually happens between the 21st and 23rd December. Tang Chek means the “arrival of winter”. Traditionally, farmers would lay down their tools and celebrate the harvest by going home to their families and a feast is prepared to mark the occasion. On this day everyone becomes one year older. It is also the day when the sun has reached the Tropic of Capricorn, and therefore is the longest night of the year in the northern hemisphere. There is always some special food associated with Chinese festivals. 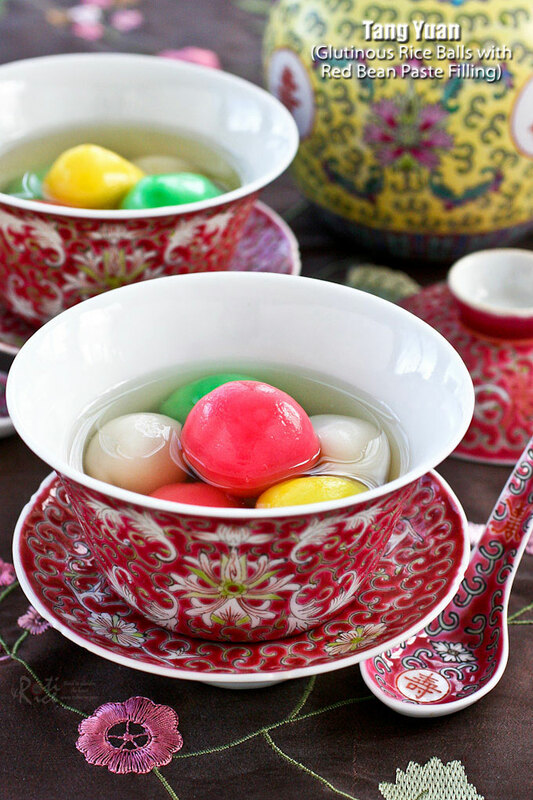 For this one, families get together to make and eat Kuih Ee/Ee Th’ng or Tang Yuan (湯圓), a dessert made of glutinous rice balls in a sweet clear soup. The roundness of the Kuih Ee signifies togetherness. In Malaysia, premixed colored dough is sold at the wet markets. The favorite colors are red, green, and yellow. Most people will buy the dough and form the balls at home, an activity much enjoyed by the kids. The sweet soup is made of a simple syrup flavored with pandan leaves and ginger. I have to admit that while I enjoyed rolling and forming the balls as a kid, this is not exactly a favorite dessert of mine. The glutinous rice balls are way too doughy for my liking. However, when I moved here, I realized that the tang yuan sold at the Asian grocery stores usually came with a filling of black sesame seed, lotus seed, or red bean paste. Now, that made a huge difference as I do like all three types of filling. Since I had some red bean paste left over from making mooncakes, I went ahead and used that for the filling. I am glad I did. Ro-Taro (eldest son) returned home from campus two days ago for the holidays and it was a time of celebration and togetherness for us. What better time to make these than yesterday so that we could enjoy them together. 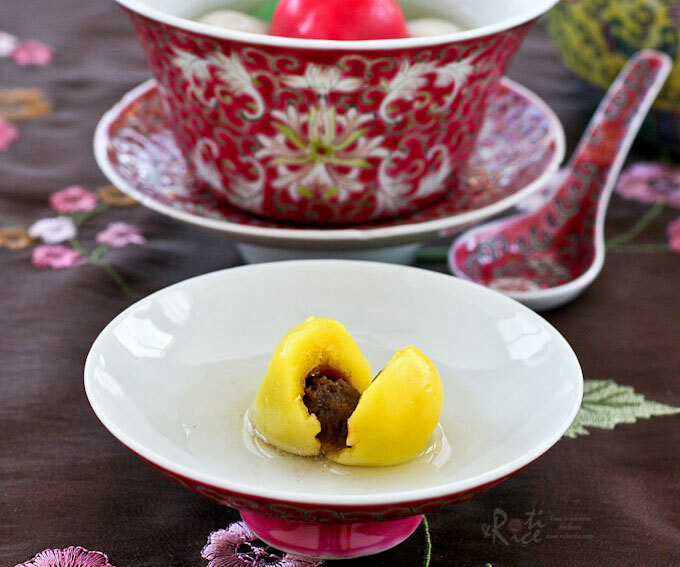 The soft and chewy glutinous rice balls with the red bean paste filling were delicious in the sweet and fragrant syrup. I would definitely make these again! 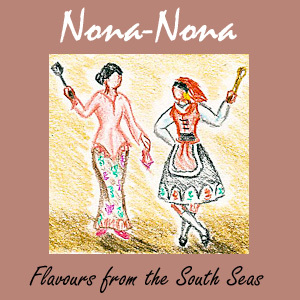 This month’s theme for Nona-Nona is DECEMBER, selected by my blogging buddy Denise. It can be any foods related to the month of December, be it Yuletide or any other seasonal or year-end specialties. For the month of October we both made the same dish. You can check out our past challenges here. She decided that we should have a broad theme this time so that we can better surprise each other and not have that happen again. I immediately thought of Tang Chek and Ee Th’ng instead of goodies for Christmas. 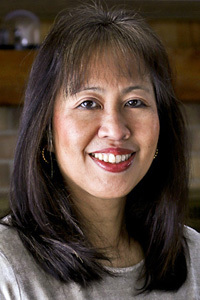 Hopefully Denise will keep with the Christmas theme. Let’s hop over to Singapore Shiok! to see what she has cooked up in her kitchen. Combine water, pandan leaves, ginger, and sugar in a medium sized saucepan. Bring it to a boil. Reduce heat and allow it to simmer for 5 minutes. Turn off heat and let the syrup cool. Place glutinous rice flour in a large bowl. Pour water over flour and mix with a spatula until a soft dough forms. If it is too sticky, add just a little more flour. Knead for 2 to 3 minute until dough is smooth. Divide dough into 4 equal portions. Set aside one portion for white balls. Add 3 to 4 drops of yellow food coloring to one portion of the dough. Knead dough until color is even. Repeat with red and green colors. Do wash your hands between each color so as not to get the colors mixed. Divide red bean paste into 24 equal portions. Roll into small balls about ½ inches in diameter. Set aside. Divide the white dough into a 6 equal portions. Flatten one portion in the palm of your hand. Place a ball of red bean paste in the middle. Wrap dough around red bean paste. Roll dough with filling between your two palms to form a smooth round ball. Place on a plastic plate or a plate lined with plastic wrap to prevent sticking. Repeat with the other 5 portions of white dough as well as the yellow, red, and green doughs. Bring a medium sized pot of water to boil. Drop the white and yellow glutinous rice balls into the water. Let them cook for about 5 minutes. They should float when done. Remove with a slotted spoon. Repeat with red and green glutinous rice balls. Place 6 glutinous rice balls in each of 4 bowls. Pour enough syrup into each bowl to cover the glutinous rice balls. Serve warm or at room temperature. HAPPY TANG CHEK / DONG ZHI / WINTER SOLSTICE FESTIVAL! I chose tang yuan as it was relatively simple and given my limited time frame, I couldn’t do anything Christmas related as it would have been too involved. I was pretty sure you would go full throttle Christmas on this post, but there was a sneaky suspicion this might happen, when you mentioned that opening it up to “December” had put many ideas in your head….and I cant think of anything else apart from tang yuan that is December related, but not connected with Christmas. 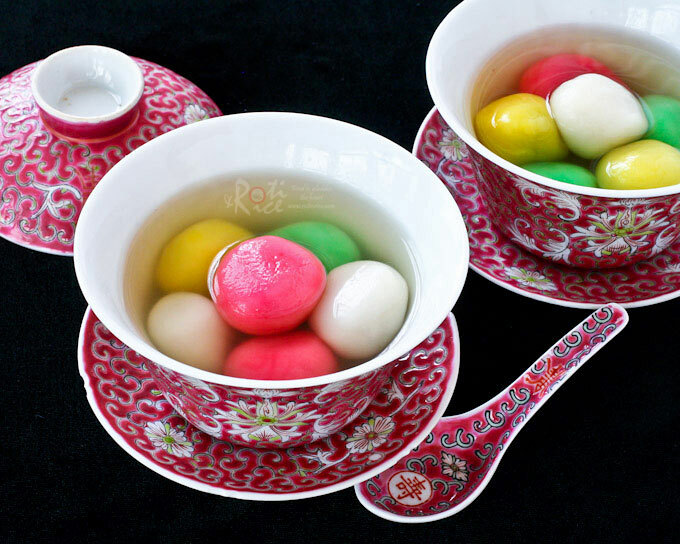 Btw – your tang yuan colours are so pretty and those gaiwan sets are showstoppers! When you said December, Tang Chek immediately came to mind. 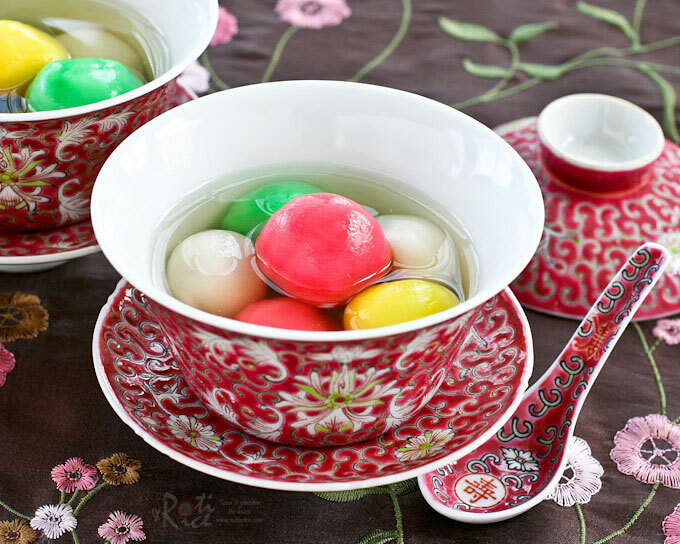 I was initially thinking of a savory dish but since it is so close to Christmas, I thought something colorful like these tang yuan might be more in keeping with holiday cheer. Anyway, I do have to think of something for next month, eh? 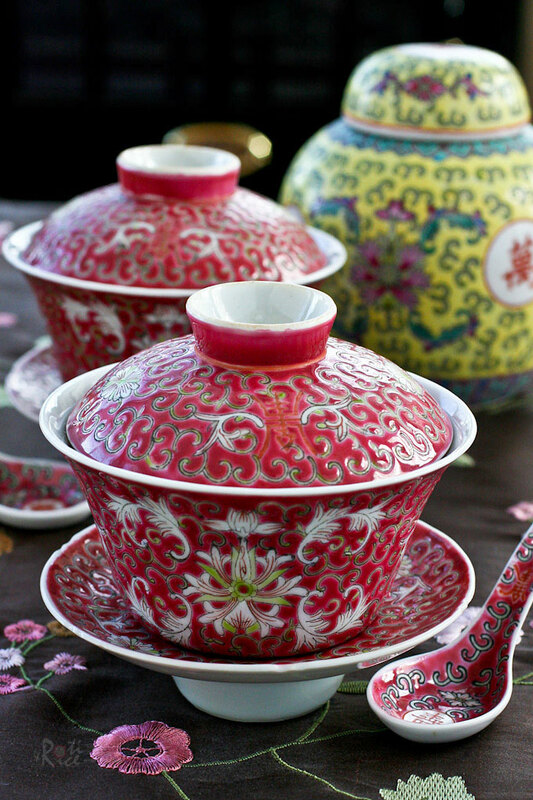 Those gaiwan sets are really special. Can’t get them these days. Beautiful tang yuen! I cant wait to make them next week with my kiddies. How pretty! Red bean filling is my favourite. I don’t really like eating these too but make them for prayers whenever I can….never done any with fillings before though….yours look so pretty! and I love your pretty red teacups! Biren, they look lovely and so tempting.Can you use any rice flour or does it have to be the glutenous one? Thanks Aban! Yes, you have to use glutinous rice (sticky rice) flour and not any rice flour. That top picture is gorgeous. And this recipe looks wonderful – love the fillings you’re using. Really good stuff, and such an informative post. Thanks so much. When I eat dim sum, I always get the sesame seed balls – glutinous rice balls filled with black bean paste. I savor them as I eat them! Therefore, I know that I would love, love, love these rice balls! What a great dessert! Enjoy the Winter Solstice Festival! With that recipe, is it alright to freeze the tang yuan if I’m going to cook them the next day or the day after? The glutinous rice balls sold here at the Asian grocery stores all come frozen. I think you should be able to freeze and cook these the next day. So cute and looks awesome..